We currently live in an icehouse  a climate in which large continental ice sheets exist, in this case at both poles. The onset of this icehouse began in Antarctica 34 million years ago and in the Arctic about 2 million years ago. The latter stages of human evolution occurred in this bipolar icehouse, and human civilization unfolded during the relatively stable, most recent interglacial phase of this icehouse (the glacial times are popularly known as ice ages). This particular climate state, however, represents only a fraction of 1 percent of Earths history. Thus, humans evolved during, and are adapted to, an atypical climate state. 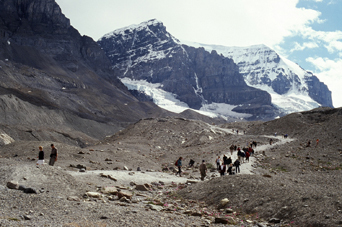 Geologists hike to the base of the retreating Athabasca Glacier in Banff National Park in Alberta, Canada. Modern glaciers are part of the current icehouse, with ice present at both poles. Courtesy of Lynn Soreghan. But although we technically live in an icehouse, we may be embarking on a one-way voyage into a permanently deglaciated greenhouse. To grasp what may be in store for the planet, we can look at the deep-time geologic record, which archives a nearly-billion-year-long record of several icehouses. Each of these icehouse periods was associated with abrupt climate change over a range of timescales, and each provides insight into the climatically fickle transitions from icehouse to greenhouse states. To understand our planets present and anticipated future climate, paleoclimatologists have typically turned to the recent history of our current icehouse  roughly the last two million years, or the Quaternary, and particularly the last 10,000 to 100,000 years. More than a decade of research evaluating ancient atmospheres entombed in ice, as well as inferring past surface temperatures from the chemical composition of ice cores and ancient marine organisms, has documented the potential volatility of our global climate system. These studies, which provide information at a resolution of decades to millennia  well within human comprehension  also reveal that prior to the last century, Quaternary atmospheric carbon dioxide levels never surpassed 280 parts per million. These carbon dioxide levels are considerably lower than our present-day atmospheric content of 379 parts per million, which continues its perilous rise at the rate of 3 parts per million per year. In a 2002 Nature paper, Lee Kump of Pennsylvania State University suggested that carbon dioxide concentrations in the atmosphere could surpass 2,000 parts per million by the time our current estimated fossil fuel resources are exhausted. Furthermore, the spectrum of documented climate variation over the past half-million years is mild relative to the anticipated average warming on Earth of 5 to 12 degrees Celsius, under such high levels of greenhouse gases. Notably, the magnitude of the climate change we are currently witnessing has no precedent in human history and no precedent in the history of our modern icehouse. Rather, projected atmospheric carbon dioxide levels for the end of the 21st century were last seen on Earth more than 30 million years ago, coincident with the transition into our present icehouse state. Thus to find a possible analog for modern-day conditions, it is necessary to dig back deeper in time; Earth has experienced icehouse climates far more extreme than those of the past 2 million years. Despite distinct differences between each icehouse period, several aspects of Earths climate and its link to the living world are common during icy times. Geologic records of transitions into and out of past icehouses contain the characteristic fingerprint of change caused by shifts in greenhouse gases, at times accompanied by increases up to several fold in atmospheric carbon dioxide levels. Rapid climate shifts were the norm during these major transitions (icehouse-to-greenhouse and vice versa), including significant change in surface temperatures and precipitation patterns across the globe. Notably, recent studies of the major shift into our current icehouse and of the icehouse-greenhouse transition about 300 million years ago suggest that Earth might be increasingly primed for abrupt climate change when initial background carbon dioxide levels are low. Understanding these transitions in the deep-time climate record is thus pivotal to understanding potential future abrupt change. Generally speaking, icehouse intervals are rare in Earths history. The fundamental evidence for past glaciation is found in the field either as scars in the landscape where ice eroded the surface, or locked in sedimentary deposits directly or remotely affected by ice. Exhumed ancient glacial valleys dating from more than 300 million years ago have been discovered on at least a few continents, and fossil ice streams as old as 440 million years have been documented in Africa. Continental-scale ice masses have left behind a range of physical evidence, from preservation of ice-rafted debris to surfaces scratched by debris-infused ice. Sediment deposited at sites that were once located at low latitudes, far removed from ice sheets, provide perhaps the most complete and sensitive record of glacial-interglacial climate changes. These include units known as cyclothems, composed of vertically stacked layers of marine and continental deposits that formed in environments not typically juxtaposed. Cyclothems, together with repeating couplets of fossil soils and wind-blown deposits, track the modulating effects of ice sheets on sea level and climate. Many of these sedimentary packages crop out on modern mountain and canyon exposures, while others are best retrieved through drilling. Ancient ice also left chemical fingerprints of climate change locked in sedimentary rocks and in the shells of fossil organisms contained within them. The major and minor elements in sedimentary deposits are proxies of weathering by surface processes and can be used to distinguish various climates. Changes in the composition of the oceans brought on by the growth and melting of continental ice sheets, along with temperature variations, are recorded in the oxygen isotopic composition of the fossil shells. Similarly, changes in terrestrial and marine biomass are captured by the carbon isotopic composition of these ancient shells. Ancient atmospheric composition and temperature are imprinted in minerals that grew in fossil soils. Another independent and complementary record of past environmental change can be found in the often exquisitely preserved fossil remains of ancient animals and plants. Field, laboratory and statistical studies of marine and terrestrial fossils, including fossil roots and pollen, provide insight into the distribution of organisms, their response to environmental changes and their evolutionary patterns. Some fossils preserve soft body parts, including cellular structure and individual molecular compounds, that provide an added dimension to unraveling Earths paleoclimate history. Deposits that are 580 million to 750 million years old that are currently exposed on land on multiple continents hold field and geochemical evidence for multiple transformations of Earth between super-greenhouse and snowball-icehouse states during the Neoproterozoic. The last of these extreme climatic excursions may have provided the trigger that led to the evolution of multicellular animal life. At least three times during this period of Earths history, the planet dipped into a deep freeze, during which time ice sheets penetrated deep into the tropics. The extent to which all oceans were frozen over remains debated, with some researchers suggesting that the snowball Earth, at times, may have been more of a slushball (see Geotimes, December 2005). Buildup of atmospheric carbon dioxide  possibly from levels lower than present-day values during glacial periods to levels up to 350 times higher  de-iced the globe. Once the climate switch flipped, Earth veered from frigid snowball to steamy hothouse (possibly with average surface temperatures of 50 to 60 degrees Celsius) within centuries to millennia. The removal of excess carbon from the ocean-atmosphere system would have provided the brake on runaway greenhouse conditions and pushed the planet into its subsequent ice age, but not until geologically slow processes such as mineral weathering on land and burial of carbon in the ocean reestablished equilibrium. The Neoproterozoic ice ages were anomalous given the overall warm climate of the Precambrian world and serve to illustrate the planets full potential for climate variability, especially when prodded by changes in atmospheric carbon dioxide. The extreme nature of the yo-yo-like climate at this time reflects the unusual distribution of supercontinents around the equator, our suns heat engine that was idling at two-thirds of its current level, and the fantastically high reflectivity of an ice-covered snowball Earth. Ultimately, however, these ice ages, which were more extreme than any ever again experienced on Earth, may literally reflect out-of-this-world conditions. Last year, Alexander Pavlov of the University of Colorado in Boulder and colleagues suggested that the planets deep chill may have occurred as the result of its passage through dense cosmic megaclouds filled with interstellar dust that would have limited the penetration of the suns heat energy to Earth. In the end, the environmental stresses, which nearly snuffed out the single-celled life that lived on the Neoproterozoic Earth with each freeze-fry cycle, may have been the requisite forcing factor for the evolution and radiation of multicellular animal life. This shift, however, was not without major environmental consequences. The ramifications of such environmental perturbation included acidified oceans during greenhouse intervals, recurrent major reorganization of the global carbon budget, and periods of sustained extraordinary surface winds and ocean waves. The take-home lesson is that Earth is capable of accommodating major perturbation to global carbon cycling, including significantly elevated greenhouse gas contents in the atmosphere, but often at timescales that exceed the time needed for life to recover. After the Cambrian Explosion 545 million years ago, the Late Ordovician glaciation (about 440 million years ago) was the first of three icehouse intervals that affected Earth once it was populated by animal life. From onset to meltdown, this glacial cycle was complete in less than 1 million years, but left in its wake Earths second largest extinction. The Ordovician ice age, like the current icehouse, initiatiated a polar ice cap in the southern hemisphere, and had glaciation and sea-level cycles driven by the waxing and waning of continental ice sheets in tune with orbital rhythms. Its initiation under an atmosphere with carbon dioxide contents roughly eight to 12 times higher than present-day levels, however, is unique. Life on Earth at the time, which was limited beyond the marine realm to liverworts on land, had radiated and diversified under greenhouse climates, and thus may have been particularly extinction-prone to the geologically sudden onset of glaciation. It is not surprising that both the transition into and out of this ice age are linked to biotic crises that together witnessed the loss of 85 percent of all species on Earth. Some 100 million years after the Ordovician, Earth experienced its longest and most widespread glaciation, referred to as the Late Paleozoic Gondwanan Ice Age. Between 330 million and 270 million years ago, the serendipity of global mountain-building processes and associated basin formation, occurring while the supercontinent was assembling, enabled exquisite and widespread preservation of rock deposits worldwide that have been the subject of decades of research. Significantly, the Late Paleozoic Gondwanan Ice Age is the only example of climate change in an icehouse on a vegetated Earth, making it the nearest analog to Earths current state  and the only example of an icehouse-greenhouse transition that records the impact on animal and plant ecosystems in both the marine and terrestrial realms. Similar to the current icehouse, continental ice sheets first developed in the southern hemisphere under generally low atmospheric carbon dioxide concentrations, and arguably may have eventually affected both hemispheres. Although the Late Paleozoic interval is considered Earths best-understood pre-Quaternary icehouse, emerging research reveals a more complex climate history than conventionally thought. Rather than a single, uninterrupted icehouse characterized by widespread ice in the southern hemisphere, this icehouse might have archived a series of shorter-lived glaciations interrupted by warmer intervals. Conversely, emerging evidence from equatorial regions hints at the possibility of surprisingly cold temperatures periodically, implying potentially severe climatic conditions in the very sensitive tropics. Cyclothems have long marked the Gondwanan icehouse as a time of relatively rapid and high-magnitude fluctuations in sea level as well. Only recently have researchers come to link these sea-level changes to climate change  resurrecting an idea first proposed 70 years ago. The huge shifts in shorelines recorded in the cyclothems reflect large-magnitude water transfers  as water previously locked in ice melted out and returned to the oceans, and cycled back again. The ultimate climatic drivers of these glacial-interglacial shifts remain nebulous. As we probe the record at finer and finer scales, however, it becomes clear that this toggling had significant and wide-ranging repercussions. Large-scale shifts in atmospheric circulation patterns in low latitudes, for example, resulted in significant changes in relative humidity, temperature, wind strength and direction, and even atmospheric dust loads; the thickest windblown dust deposits yet recognized in the geologic record occurred during the Gondwanan icehouse. The significant shifts in Earths climate triggered large-scale reorganizations of the marine and terrestrial biosphere, as repeatedly changing habitats precipitated widespread migration, evolution, extinction and diversification in many groups, particularly in the tropics. The ultimate demise of this Gondwanan Ice Age was the last time in Earths history to witness a transition to an ice-sheet-free world, a condition that lasted until 34 million years ago. The climate history that is unfolding for this paleo-deglaciation mirrors the newly emerging record of atmospheric composition and climate instability that foreshadowed the transition into our present glacial state. This implies that rapid fluctuations in atmospheric carbon dioxide and surface temperatures may be the climatic norm during Earths transitions from one major state to another. Anticipated anthropogenically driven climate change may ultimately lead to such a climate state turnover, but at a rate unique to the history of this planet. A few years ago, Sir John Houghton, former co-chair of the Intergovernmental Panel on Climate Changes working group, described modern global warming as a weapon of mass destruction. If modern global change heralds the exit from our current icehouse, then the history of icehouse terminations and biospheric repercussions as archived in the geologic record suggests this is indeed an apt description. Human civilization has developed during an extremely rare climate, geologically speaking, one with large-scale ice sheets at both poles. Only recently have we begun to understand that what we think of as normal climate is not in fact normal (see main story). Earths climate changes perpetually, far beyond the limits known from the modern and near-modern worlds. That Earths climate has lurched to extremes far beyond human experience consoles some people  why worry if extremes lie within Earths comfort zone of natural variation? But with our carbon dioxide output rising at an unprecedented rate, we are now exiting the comfort zone of human experience, following an accelerated synthetic path. The planet is warming perceptibly, and globally averaged temperature projections forecast an increase of several degrees Celsius within the century. The outcome of forcing the planet into a greenhouse during what is otherwise an icehouse is currently beyond prediction. Model predictions of climate states for the near future (next 20 to 200 years) exhibit considerable variability, which is inherent to the uncertainty of the science. Scientists must improve knowledge and their presentation of that knowledge to help decision-makers prepare for the future and manage for the consequences of the human presence on this planet. But we cannot claim to be maximizing our contribution to this discussion when 99.96 percent of Earths climate behavior remains virtually unexplored. While Earths near-time geologic past teems with high-resolution climate data, and studies of the last 2 million years have refined our understanding of our nearest icehouse relative, they archive only a tiny slice of Earths history. It is necessary to find and understand more analogs for our near future with high levels of carbon dioxide. Ice-core data demonstrate we are experiencing the highest levels of atmospheric carbon dioxide ever breathed by our species; even with drastic emissions reductions, our grandchildren will experience values known only from Earths deep-time past. Powerful developments in our abilities to read, date and model Earths history are elevating the reach and relevance of deep-time climate research. A decade ago, Earths climate was not imagined to have veered to such extremes as are now recognized for the geologic past, nor at such rates, except within the realms of planetary geology or science fiction. Our thinking had been overly conditioned by Earths modern and recent states. Still, uncertainty in assessing future climate remains because key components of the system have not been fully, or even mostly, investigated. We need a holistic understanding of the system  an understanding that can be developed only by exploring the full spectrum of events that have occurred on Earth. The need for this holistic understanding of the deep past is driving the grassroots GeoSystems effort (www.geosystems.org), which is a multidisciplinary community of researchers formed to raise awareness of existing and potentially new high-resolution data mined from deep time, to better understand Earths climate history. Compiling such information helps scientists to address key unknowns of climate-system behavior. Processes controlling abrupt change, the effects of aerosols, the identity and role of feedbacks, and the effects of alternative oceanic circulation, for example, are reachable in deep time. On long geologic timescales, the biosphere and atmosphere have clearly co-evolved, and the paleobiologic record houses the history of lifes response and recovery to alternative Earth climate states. Additionally, interactions between climate and tectonics remained below the radar of our collective consciousness until only recently, but are clearly key, and uniquely suited for deep-time study. Researchers in a variety of fields are coming together to better understand deep-time paleoclimate, using a robust geoinformatics system to host data and enable analysis, synthesis and correlation. Integrating these advances in data with developments in climate modeling offers the potential to exploit deep-time datasets to improve prediction with reduced uncertainty. Climate research in deep time adds a new dimension to the climate change discussion. Policy-makers must understand that few final answers exist in science, and that we must continually push the envelope of our knowledge to ensure that their decisions are the best possible. Climate research in deep time and near time are not adversarial, but symbiotic  each contributing needed dimensions to the whole. Significant discoveries await our concerted efforts, and our open minds. Put simply, if we wish to predict the near future, we need to probe the deep past. Soreghan is an associate professor in the School of Geology and Geophysics at the University of Oklahoma. Snyder is a professor in the Department of Geosciences at Boise State University. Both are involved in the GeoSystems effort (www.geosystems.org). Berner, R.A. and Kothavala, Z., 2001, "GEOCARB III: A revised model of atmospheric CO2 over Phanerozoic time," American Journal of Science, v.301, p.182-204. IPCC, 2001, Climate Change 2001, The Scientific Basis, Cambridge University Press, Cambridge, 881 p.
Pearson, P., and Palmer, M., 2000, "Atmospheric carbon dioxide concentrations over the past 60 million years," Nature, v. 406, p. 695-698. Petit, J.R., and 18 coauthors, 1999, "Climate and atmospheric history of the past 420,000 years from the Vostok ice core, Antarctica," Nature, v. 399, p. 429-436. Siegenthaler, U., Stocker, T.F., Monnin, E., Lüthi, D., Schwander, J., Stauffer, B., Raynaud, D., Bamola, J.-M., Fischer, H., Masson-Delmotte, V., and Jouzel, J., 2005, "Stable Carbon cycle-climate relationship during the Late Pleistocene," Science, v. 310, pp. 1313-1317. Montañez is a professor in the Department of Geology at the University of California in Davis. Soreghan is an associate professor in the School of Geology and Geophysics at the University of Oklahoma. Both authors are involved in the nascent GeoSystems effort (see sidebar, above).